Spend your Caribbean vacation on Pine Cay, a secluded private island resort located in Turks and Caicos, British Virgin Islands. The island offers two miles of talcum powder beach, clear waters and varied marine life. This private island hideaway has seven freshwater ponds and measures 800 acres in size. There are no automobiles or even telephones, allowing you to rejuvenate and rest, surrounded by nature and songs of tropical birds. The waters around Pine Cay, averaging 75-80 degrees, are perfect for swimming, snorkeling and scuba diving. This all inclusive resort has a freshwater swimming pool, a tennis court and bicycles to reach other island beaches. Fishing is also available off the island. Early breakfast is served on the open-air dining terrace, featuring freshly baked pastries and coffee. English breakfast follows with freshly squeezed juices, lobster omelets and coconut waffles. You can also have the breakfast delivered directly to your room on your vacation. For lunch, enjoy a light buffet of Pine Cay specialties, followed by mid-afternoon traditional tea. Candlelight dinner is served outdoors, featuring fresh seafood. Sand Dollar Spa offers a choice of relaxing treatments, including massage, manicures and facials. Balinese massage therapy employs gentle stretches, deep tissue kneading and fragrant oils to relax and heal. There are only 12 rooms and a cottage to choose from, providing guests with privacy and seclusion. In addition to the hotel there are several privately owned cottages on the island, some available for rent. Club Rooms face the secluded beach and have both indoor and outdoor showers. The Sand Dollar Cottage is great for honeymooners since it provides additional privacy. Beachfront Club Rooms: Each of these stylish accommodations overlooks the two-mile-long beach. Enjoy breakfast or early morning coffee on the screened-in porch. You will also have your own private thatched tiki hut close to the sea, perfect for reading and sipping cocktails at sunset. Sand Dollar Guest Cottage: This unique six-sided "Tiki hut" style cottage is separate from other buildings, surrounded by pine trees and the beach. This is a perfect choice for honeymooners who want plenty of privacy. Doubles start from $895 USD per night plus tax and service charge December 19 through April 19, and from $650 the rest of the year. The resort is closed from July 1 to October 31. The rates include three meals daily and many island activities. The resort offers honeymoon and family packages. 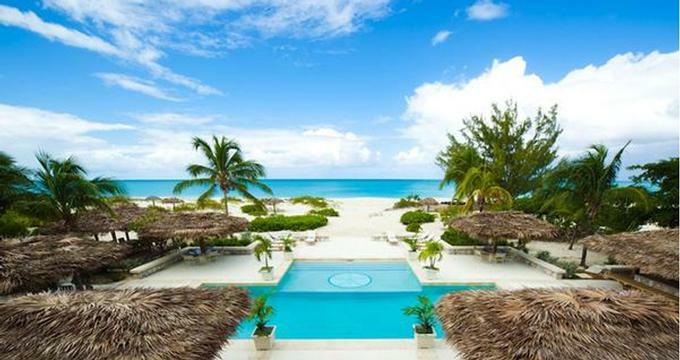 Fly to Providenciales ("Provo") in the Turks and Caicos Islands from Miami. Check with the hotel for transfers from Provo to Pine Cay (there is no service after dark).